High levels of volatility continued throughout Wednesday’s session. Both the euro and sterling took heavy losses as markets withdrew into crisis mode. The VIX, seen as a global barometer of fear in the market spiked overnight for a second time and precipitated a brutal selloff in Sterling and other risk assets. GBP/USD experienced its biggest one day drop in three months. The selloff began in the Asian session and accelerated after the London markets opened. GBP/USD sank 1.6 percent reaching as low as 1.5466. 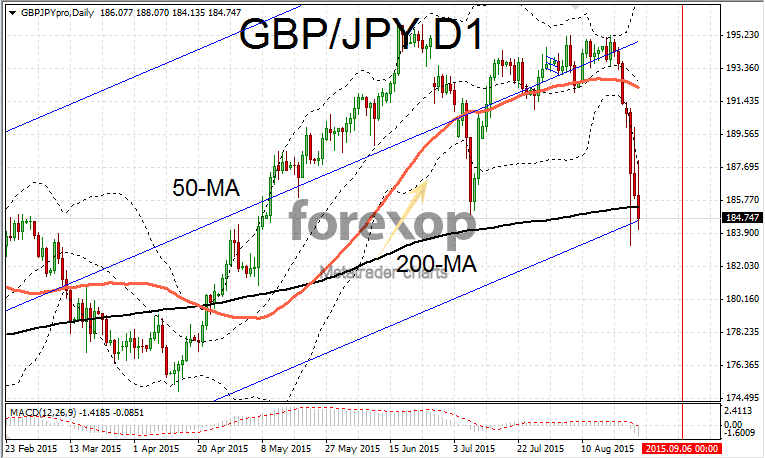 The lower support levels for cable (GBP/USD) are expected around 1.5438 and then 1.5397 but given the speed of the drop the lower levels could well be tested within the next few hours. Cable had peaked at 1.5875 earlier in the week as the dollar took the brunt of the turmoil in Chinese financial markets. However global investors now have to adjust to a new reality in which a September rate hike by the Federal Reserve, which looked a certainty last month, is looking increasingly doubtful. 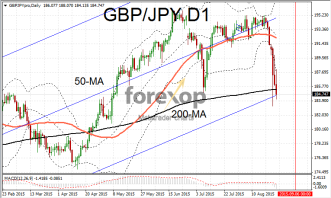 GBP/JPY was another heavy faller over the session. The pair dropped to 184.73 with the 200-day moving average failing to offer any rebound opportunities for GBP. Yen buying accelerated overnight as investors became increasingly spooked by the inability of Chinese authorities to halt the slide in equity markets. The PBOC added a further 14 billion dollars of liquidity into the markets on Wednesday to try to stem the selling pressure. Despite these efforts the Shanghai Composite ended the session down a further 1.3% which brings the week’s total losses to 16%. The euro also suffered a deep correction. EUR/USD slipped by 1.6 percent to 1.1370 as a wave of sell orders hit the single currency. EUR/USD reached a 32 week high on Monday by topping 1.1713. Both sterling and the euro were overbought to some extent and therefore a correction to some extent was looking inevitable. EUR/JPY suffered its fourth day of steep falls taking the pair down to 135.99 from 139 last week. After rising early on sterling started to show strength again and push EUR/GBP into the red for the first day in seven. EUR/GBP fell to 0.7290 but recovered some ground moving back up to 0.7344.